The Vancouver Aquarium was the site of a fierce battle last night, when 14 top Ocean Wise chefs from British Columbia ladled out their best work for guests and judges at the 2013 Vancouver Aquarium Ocean Wise Chowder Chowdown. The competition, which featured ocean-friendly seafood chowders served with local beer, was all in the name of sustainable seafood. The evening’s victor was Ned Bell of Yew Restaurant, who was crowned by both an esteemed judging panel as the 2014 Vancouver Aquarium Ocean Wise Chowder Champion, and by event guests as winner of the People’s Choice award. Chef Bell wowed both judging panel and guests with the recipe for his flavourful and super-local “Chowda,” featuring Ocean Wise smoked black cod with Okanagan apples, Chilliwack corn and Fraser Valley honey. 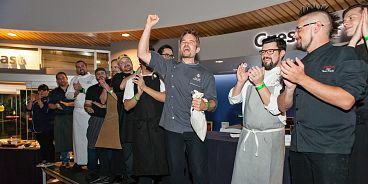 Past two-time chowder champion, Chris Whittaker of Forage, won the award for Best Beer Pairing by dishing up his Smoked Sablefish and Chanterelle Mushroom Chowder alongside ale from R&B Brewing Company. The seventh annual Ocean Wise Chowder Chowdown showcased 14 Ocean Wise chefs who joined the sustainable seafood movement by competitng head to head in a friendly competition with their original, ocean-friendly seafood chowders, served with local beers. The diverse ingredients of the chowders ran the spectrum, from Ocean Wise honey mussels to wild Pacific albacore tuna. A list of participating chefs and their bios can be found here. · Guy Dean – vice president and chief sustainability officer, Albion Fisheries Ltd. This year’s Ocean Wise Chowder Chowdown in Vancouver was made possible with the support of Transtar Sanitation Supply Ltd. and Albion Fisheries Ltd.
Vancouver Aquarium’s Ocean Wise Chowder Chowdown events takes place in Vancouver, Calgary and Toronto annually to raise awareness about the importance of choosing sustainable seafood. Overfishing is the single biggest threat our oceans face today. Ocean Wise makes it easy for consumers to make sustainable seafood choices that ensure the health of our oceans for generations to come. The Ocean Wise symbol next to a seafood item is the Vancouver Aquarium’s assurance of an ocean-friendly seafood choice. www.oceanwise.ca.